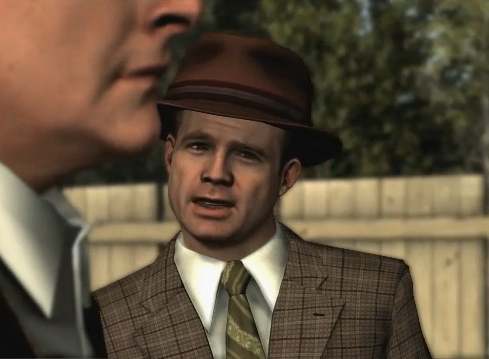 The penultimate DLC case for L.A. Noire, “Nicholson Electroplating” is now available for download via PlayStation Network (£3.19) and Xbox LIVE (320 MS Points). For holders of the Rockstar Pass, the case is now unlocked for download at no charge. At 9:45 in the morning, a thunderous explosion rocks Los Angeles. City blocks are flattened and smoke and ash fill the air. Detectives Phelps and Biggs race to the site of the former Nicholson Electroplating plant to find a pile of unanswered questions. What caused the explosion? What were Nicholson’s employees working on? And where are chief chemist Dr Harold McLellan and his mysterious female assistant? The all-new case sees Phelps and partner Biggs digging for clues amongst the rumble of city blocks devastated by the explosion. Over the course of their investigation not only will the duo interrogate new witnesses and suspects, but also explore entirely new locations including the hangar that houses Howard Hughes’ famous Spruce Goose. Below you will find a link to with all-new screenshots and the Nicholson Electroplating trailer. In addition, a case fact sheet and a detailed description of the real-life O’Connor Electroplating Company disaster are located in the attachments for your reference. As always, please feel free to reach out with any questions.